Water Pipe Insulation - It's a small thing that makes a BIG difference. Insulating water pipes saves on energy cost and protects pipes from damage caused by extreme temperatures. As an energy saver, wrapping your water pipes in an insulating material is a logical extension to adding a water heater insulation jacket. But pipe insulation has other benefits besides saving energy. 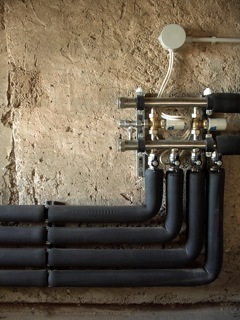 Insulating your water pipes saves a lot more than energy. Reduce running water syndrome. Keeping the water that's in the pipes at the desired temperature puts the kaibosh on running the water til it warms up, or cools down. An alarming amount of your water is probably going directly from faucet to drain, with no stops in between, just waiting for it to arrive at the perfect temperature. Once you've finished insulating, add water savers to your faucets for more water savings. Noise muffling. Quiet the creaks and groans of an aging water system. Especially in old houses, pipe insulation will muffle the sounds of the system as it goes about its tasks. Reduce temperature transfer Insulation will prevent heat and cold from unprotected pipes from quickly migrating out of the water into the surrounding air. Also, when hot and cold pipes are located side by side with little space between them, a transfer of temperature between the hot and cold water occurs. This causes both taps to deliver a stream of water that is neither hot nor cold. A barrier, like insulation, prevents this transfer by separating and isolating each pipe. Prevent freezing. Water pipe insulating is a must in locations where temperatures stay below freezing during the day and for long periods. We really liked the foam pipe sticks for our outdoor pipes when we lived in Alberta. Add an Outside Faucet Cover to the tap to protect it from freezing temperatures and keep it ice free. Insulating water pipes maintains water temperature and protects pipes from freezing, or even bursting in extreme cold temperatures. Visitors to our Water Pipe Insulation page may also be interested in the following pages.